The International Space Station can be seen streaking across the face of the moon in this composite of nine different images captured by NASA photographer Bill Ingalls, all in just .82 seconds, on Sunday, Aug. 2, 2015. He was observing from Woodford, Virginia. Just two days after the second full moon of July created a so-called blue moon, a NASA photographer captured some stunning views of the International Space Station zipping across the lunar landscape. 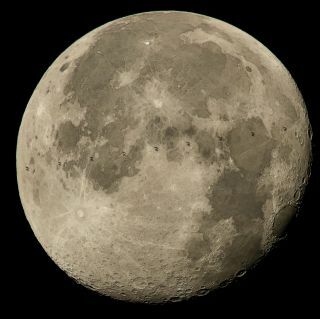 When the space station soared between the moon and Earth at around 5 miles per second (8 kilometers per second) Sunday night (Aug. 2), NASA photographer Bill Ingalls was in position to capture the sight from Woodford, Virginia. Ingalls had two hours to set up four cameras after driving to his pre-calculated observing location. He then had only .82 seconds to snap the shots as the tiny silhouette of the space station passed by. "It's what you do when you are set up 2hrs in advance of [a] 0.82 of a second photo op!" Ingalls wrote on Twitter, where he posts his photography as @ingallsimages. A GIF animation of Sunday's early-morning transitwas also posted by Joel Kowsky, another NASA photographer. Kowsky and Ingalls also took long-exposure views of the space station streaking across the sky over the weekend. You can see those images and more of Ingalls' lunar transit photos on NASA's Flickr page NASAHQPhoto. The station is always orbiting Earth, but it takes careful planning and positioning to catch the moments when it lines up with the moon. The International Space Station is the largest human-built object in space and can rival Venus in brightness in the night sky, but only if you know when and where to look. The streak in the night sky in this photo is actually the International Space Station soaring overhead at 5 miles per second. NASA photographer Bill Ingalls captured this photo in a 30-second exposure on Saturday, Aug. 1, 2015 from Elkton, Virginia. To determine where to aim cameras, binoculars or telescopes at the space station, skywatchers can use websites like NASA's Spot the Station to find viewing times and dates for their location. To catch it crossing the moon or sun, though, takes even more precise timing. Other websites to track the space station and other satellites in the sky include Heavens-Above and ny2o.org. The International Space Station is currently home to six astronauts, three of whom arrived on July 22. The crew includes NASA astronauts Scott Kelly and Kjell Lindgren; Russian cosmonauts Gennady Padalka, Mikhail Kornienko and Oleg Kononenko; and Japanese astronaut Kimiya Yui. Editor's note: If you ever capture an amazing view of the International Space Station flying overhead and would like to share the image with Space.com for a story or gallery, send photos in to spacephotos@space.com.